A compact, rounded shrub that has blue, purple, and pink blooms all at the same time. 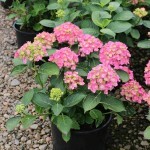 This hydrangea is a strong rebloomer for extended summer color. It prefers full sun to partial shade, in a moist, well drained soil.